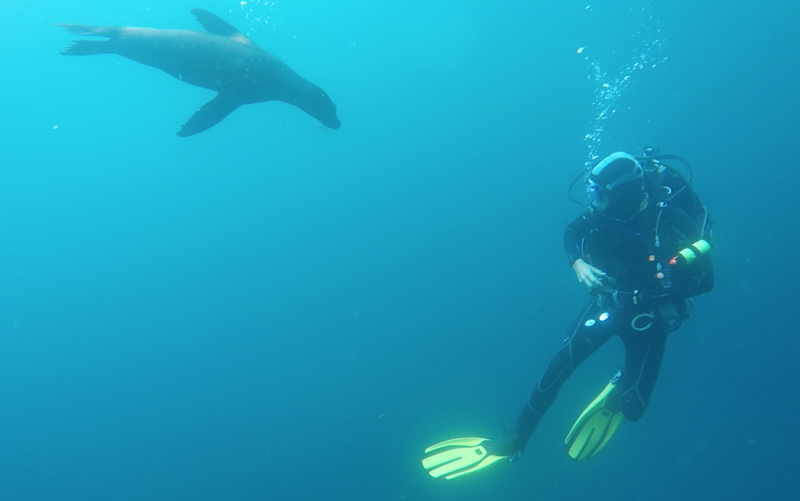 Brown marine biologist Jon Witman and students have spent much of 2016 in the Galápagos Islands, continuing years of chronicling the complex and dramatic ecological changes wrought by the increasingly volatile El Niño – La Niña cycle. 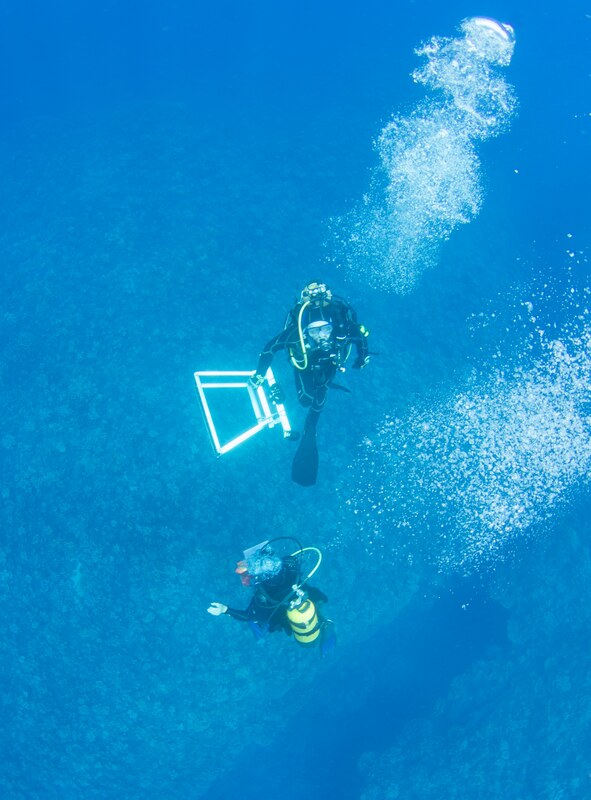 PROVIDENCE, R.I. [Brown University] — When Brown University Professor Jon Witman returned this year to a small patch of coral off the Galápagos Islands that he had first marked off for study in 2000, he saw virtually nothing — and that told him a lot. 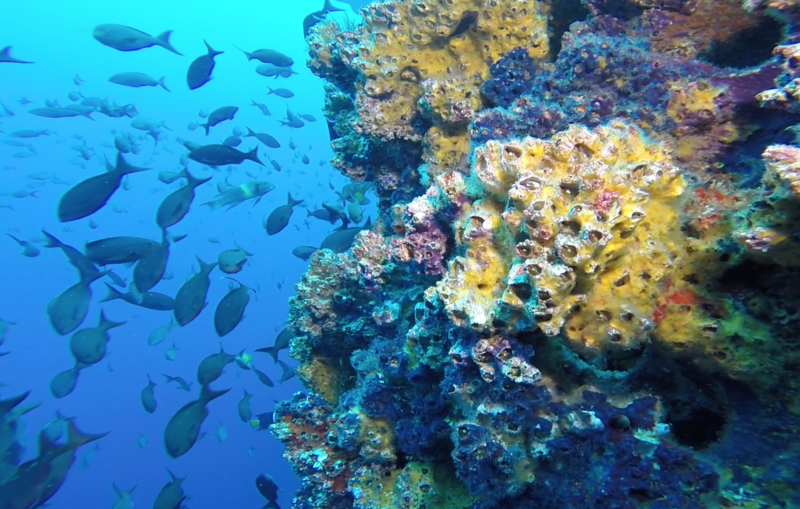 An underwater ecosystem that had been teeming with diverse life 16 years ago was now a barren patch, an apparent victim of increasingly strong El Niño weather systems amid global climate change. The same patch of coral in 2000 (left) and 2016 (right) shows a severe decline in its biodiversity. This year, with funding from the National Science Foundation, Witman has made several expeditions with graduate and undergraduate students to witness the effects of the latest El Niño. He journeyed to the Galápagos in January, March and again last summer, and he’s there again now through February on sabbatical. He celebrated Thanksgiving with graduate student Robert Lamb and colleagues at the Charles Darwin Research Station with a holiday meal of ahi tuna, cornbread, pumpkin soup and baked sweet potato. 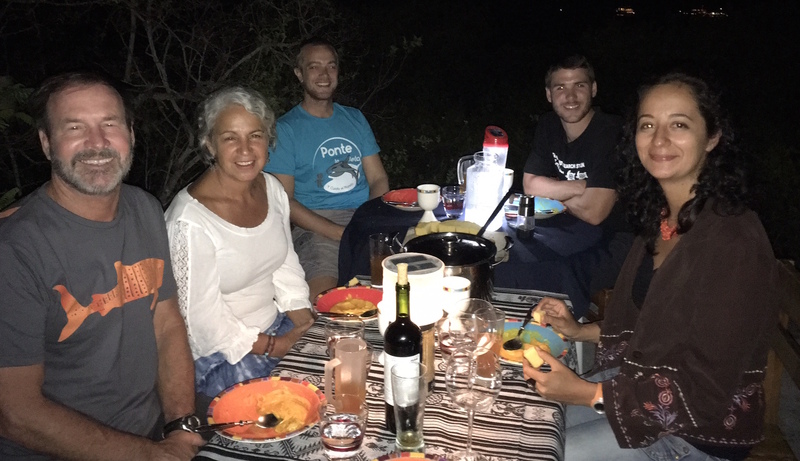 Witman (left) and company enjoy Thanksgiving far from the U.S.
“During this past year of fieldwork in Galápagos, there were so many surprises that we could hardly keep up with all the effects of the strong El Niño,” Witman said. Amid the warmest water at the beginning of the year, for example, Lamb discovered the emergence of a skin-wasting disease in the reef fishes that he studies. The disease abated later in the year as the cooler La Niña took over from El Niño. But other changes associated with the warm water were apparent, too: rampant grazing of algae by sea urchins, for example, and the ominous emergence of mats of cyanobacteria. Among the responsibilities assigned to Beltram, who joined the team in the Galápagos this summer, was to set up experiments to study the cyanobacteria. She also helped to measure what’s been going on at about two dozen specific areas, or “transects,” that Witman has been monitoring for years. 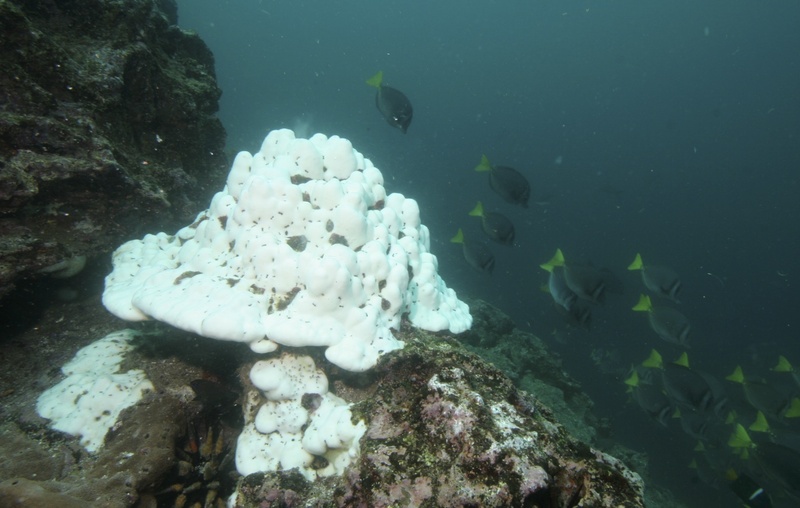 Warm El Niño waters harm the corals. The colder La Niña encouranges the growth of barnacles, a major food source, on the corals. The question, though, is whether that beautiful place will last. Over the years, Witman said, the El Niño - La Niña cycle has yielded a pattern that alternately seems to destroy, but at other times redeem the subtidal ecosystem’s stunning biodiversity. That deteriorates the corals further, but the barnacles serve as food for many other species, promoting a rebound in the undersea life. But the more Witman and his team dives in — literally and figuratively — the more they see that the long-term trend is worrisome. At least for now, the food webs in the area remain full of characters, all of whom have a role to be studied. Lamb and Witman spent November formulating experiments to test hypotheses about what species are grazing on algae and how much. They deployed cages that selectively exclude herbivorous fishes or sea urchins, the two major groups of herbivores in this ecosystem. Because algae serve as the basis of much of an ecosystem’s productivity, the answers to these questions come with profound implications. Too much algae consumption can undermine the food supply for other species and reduce biodiversity. 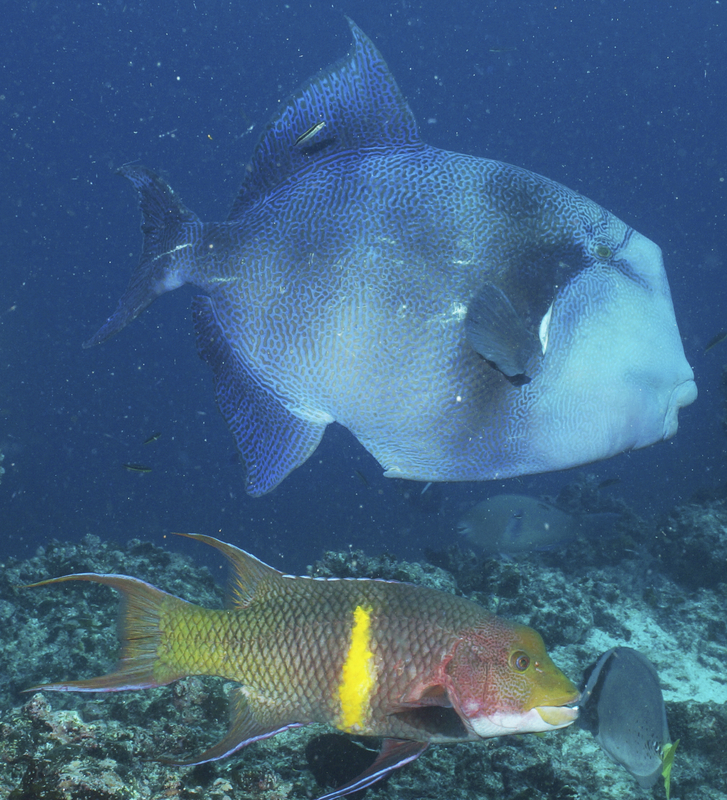 A triggerfish (top) swims along with its rival the hogfish, which will take urchins out of its mouth. The food webs play out in complicated ways, Witman has found, as species fight to survive. As it did for Darwin, the Galápagos still deliver plenty of new lessons about how nature works — the critical role of triggerfish, for example. As Witman and his students — over the years he’s trained nine undergraduates, six doctoral students and three postdoctoral scholars in the Galápagos alone — continue to piece together how subtidal life is changing with climate in the islands, he’s also working globally. He took a side trip in early December, for example, to check on another of his regular spots: coral reefs near Easter Island, far off the coast of Chile. When he’s home in New England, Witman can often be found in the Gulf of Maine at Cashes Ledge, the largest and deepest offshore kelp forest in the North Atlantic. There, too, climate change may threaten biodiversity. “We are studying the resilience of the kelp forest to warming, as it is such an ecologically important species, and also trying to achieve permanent protection for the spectacular marine communities on Cashes Ledge as a U.S. Marine National Monument,” Witman said. Lamb is working concurrently to show how the unique kelp forests on Cashes Ledge are home to some of the healthiest populations of cod and pollock in the southern Gulf of Maine. Whether in the warm waters of the South Pacific or the much chillier North Atlantic, the goal is to understand how ocean ecosystems work so that people can help them thrive rather than threatening their survival.